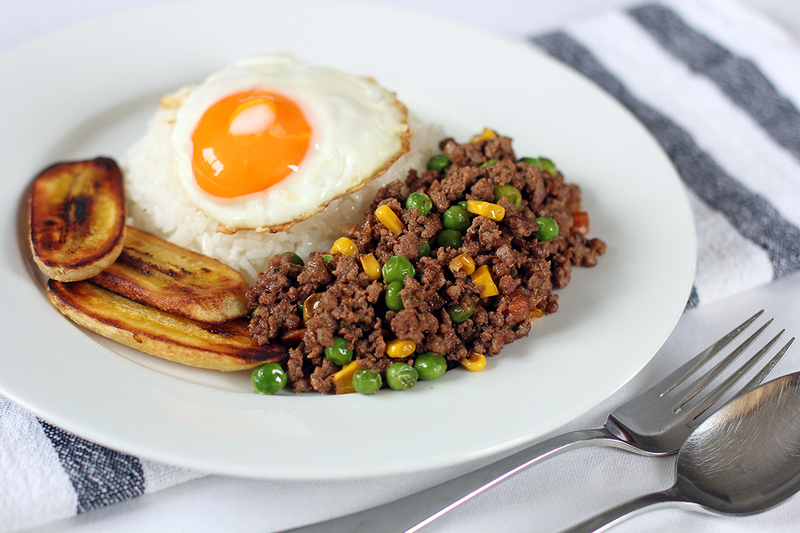 Arroz ala Cubana is a Philippine dish that consists of sautéed minced beef, white rice, fried egg and fried cardaba (saba) banana. A dish that originated from the Spanish arroz a la cubana which is nearly similar but instead of the sautéed beef it is served with tomato sauce. Another version of this dish also exists in Peru where it is served not with tomato sauce neither beef mince but with fried hot dog. Arroz a la Cubana when directly translated means “Cuban rice” but despite its name this dish did not originated from Cuba but in Spain. Another simple dish to prepare and best of all it a complete meal where you can get your fruits, carbs and protein in one plate. In a pan add a small amount of oil then fry banana pieces until golden brown on each side. Remove from pan then set aside. Using the same pan add oil then sauté garlic and onions. Add minced pork and beef and cook for 10 minutes or until meat is brown. Add the corn, peas and carrots and cook for 5 minutes. Add soy sauce and season with salt and freshly ground black pepper. Turn heat off then set aside. Place rice in the middle of the plate, top it with fried egg, place Sautéed Minced Meat at the side and fried bananas on the other side. Serve. This name of dish is familiar! I made it with Malou (Skip to Malou)’s recipe before and I really enjoyed it. Yours look wonderful, Raymund! I only have the Spanish version here, which is delicious. The important thing of every version is the egg, and this is why I love it! From the name of the dish I was expecting Cuban Rice. The egg on top looks delicious and the combination of ingredients sound really good. What an interesting dish! Oh boy, what a breakfast. I’d eat it any meal of the day. It has an egg on top! I want it1 Another easy and delicious looking recipe! Like the side of banana! The world at times is not such a big place: as a Danish housekeeper of mine way back in Australia insisted on making pyt’i’panna: ‘bits’ fried like this/that for dinner. Don’t rememebr the corn: perchance 🙂 ! When we went to Cuba, they served plantains with everything…everything! Breakfast, lunch, dinner…! This rice is nice for my kids who need a balanced meal! I think I like this Filipino version the most. Juicy mince, rice and egg perfect in itself. The banana sounds good, but I’ve never heard of them before. You never stop learning. This looks perfect! Love the color, recipe, and your photo! We’re just headed out for brunch today, if only they offered this sort of dish!! I’ve actually never had this lol, I don’t think I even remember seeing it on a menu in the Philippines (though I know it’s a completely Filipino dish). Must remedy that soon – I’d love to eat this for dinner. I’ve been a lurker for months and I simply couldn’t pass this one up, I just had to leave a message. Arroz a la cubana brings so many memories for any child in Spain. Loved to see the Filipino take here! In Spain many people would say “arroz a la cubana” must have fried bananas on the side, but in my family the bananas were left out, arroz a la cubana was white rice* with tomato sauce, fried egg and sausages (franks). It was delicious every time, but there is something that makes all the difference for us Spaniards: *the rice in arroz a la cubana, “white rice”, can never be eaten straight from the boiler – it must be sauteed in olive oil and tons of garlic. That’s what “white rice” (arroz blanco) means for me, as opposed to “boiled rice” (arroz cocido).